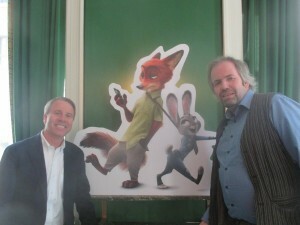 I did this interview with producer Clark Spencer last October 2015, when he visited Hamburg and Munich to promote his new film Zoomania aka Zootopia. He first walked us in a short presentation through the movie, showing us bits and pieces from the movie, around 15 minutes including the outstanding sloth scene, when Judy and Nick try to get information about the car license number early in the story. Johannes: There is this hilarious visual joke – the bitten carrot on Judys Laptop. Clark Spencer: It was one of the great fun things to do in the film because we created a modern world created by animals but we still needed to be relatable to humans. Because John always says: Make the world believable!!! Make it a world, we do not know – then it becomes science fiction and that is not really fun in animation. So in the result to make it believable and grounded, we did things that made the world very animal and then placed something like the I-Paws instead of the I-Pads in the film and then we put a carrot on it just to give it the extra layer, that the audience may see or may not see… but it is like giving a lot of depth to the movie. Johannes: Same with the hilarious „Prey-Da“ Label instead of PRADA, which you can see on the poster. Tells me, that the people involved making the movie loved the project! Clark Spencer: They loved it indeed. For two reasons I think. We have not done an animal film in a very long time! An all animal film basically since the Lion King! So for the animators, for the visual developing team, for the character designers, they were just having a blast doing animal instead of humans. It was really using a different kind of tool set for them. And then for the story team and for the writers and the directors and even for the other artists as we started to develop the world, everybody came up with these great ways of incorporating things into it like Prey-da or Lulu Lemmings or Bearberry one of those things where you can just riff on puns and other ideas that we feel like really mix, hopefully mix, that people, when they look at it, realize that is going to be a really funny movie. Johannes: I read somewhere, that there has been a gag board in the old Disney studio in the Thirties and Forties, where everybody was invited to put gags on for a short or a feature film for 5 Dollars or something, so that those gags could be incorporated into the movie. Zoomania is so rich of great details, you have to see it four, five times to get everything and later on you can go through the movie frame by frame when it will be released on Blueray or Dvd to find even more. This reminded me somehow of the old gag board. Clark Spencer: Yes, they come from unexpected places! I always have told this as an example – this is going back to Ralph for a second, where there is a moment, where we had to figure out how – end of the second act, Ralph is going back to his game and he is all by himself in the appartment building, he has to figure out why he thinks now, that there is something wrong. And what he does, is, he sees Vannelope´s Face actually on the side of this Game that she is in – „Sugar Rush“. And we could not figure it out in the first place. No! Storyartists could not figure it out. Writers could not figure it out. Directors could not figure it out, even the story trust could not figure it out. Nobody could give us a simple way to do it. And someone emailed us and said „What, if her picture was on the side of the game cabinet?“ And you think to yourself: „That is the most brilliant idea I ever heard of!“ Or why would she be on the side of the game cabinet, if she was not actually supposed to be a big character in the game! So to me that really opened up the sense of „You have to always encourage people!“, whether it is gags, storytelling, emotion, whatever it is, people, design, whatever it might be – people have great ideas! Those are all creative people. Do not assume that only twenty people can figure that out! Let the whole studio be a part of the creative lab. Johannes: You called it this now the second Renaissance of Disney animation, there have been difficult times in the past for the Disney studios after the perfect storm of people came up with movies like Mermaid, Aladdin, Beauty and the Beast and The Lion King – the so called first renaissance. It is great to see that this communication of creativity has come back. Now I have to say this is a rare thing here in Germany too. So we need your advise here. How can you relearn this kind of creative communication amongst artists to make the movie better in every way. Johannes: Yes, I think you started this somehow alongside the production of „Meet the Robinsons. It is tricky, because I have seen Don Hahn´s beautiful documentary „Waking Sleeping Beauty“, if „Frozen“ is your „Lion King“ you could be in for trouble, seeing what happened after Lion King phenomenal success. 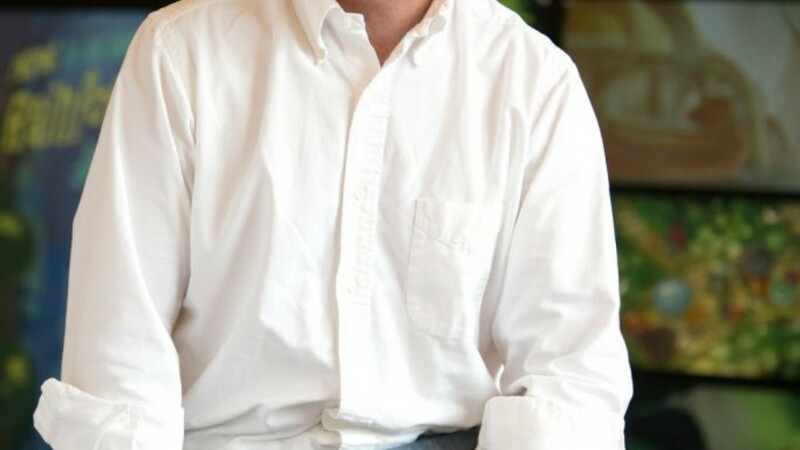 Clark Spencer: I think what the key is, and this is really important: Nobody believes, that we are as great…, , nobody believes that we hit our pinnacle, we have achieved our pinnacle. Nobody says we have achieved that – now we just can do that. Frozen is just a film building to greater things to us. Boxoffice cannot always be the determination of success because in the end of the day. films hit in different ways, in different moments in time for different reasons, we all know that aspect of it, but the key is, if every film is telling a great story and if the audience is going to see that film and love it, then we are doing our jobs correct, obviously: do we want our films to go out there and be that succesful? Absolutely. But you can´t assume that that you will do every time. That is not what John Lasseter says. He doesn´t say every film has to be that. What John says is that every film has to be great in terms of its storytelling with compelling characters and a believable world. And if we will do that, people will come. And people will do come in a way that we will still be creative, we will still hold on to the fact that people will say Walt Disney and Pixar are making great movies. That is what our goal ultimatively is. And the rest of it comes, when it hits on the right moment. Or it comes because the story is great or it is a combination of the two. And I think, that is it what it is really for me, what I appreciate about John. We are not chasing dollars, we are chasing good stories. Amy Astley: You see, when we did Lion King, everything had to be muscials at that time. If you look at the projects we are doing right now? Frozen is the opposite of Big Hero Six, Zootopia is very different from Moana. Four films that are totally different from each other… So I think this is a great statement of the vitality right now as well. Clark Spencer: We are not doing the same thing again. We are not saying, now let us repeat this. And also what is important to me, there is a lot more of animation out there. So as a result we know, that everybody… we have a lot of competition out there that we always have to be thinking about. And I think in the days of Lion King, well being there, you know it felt like Walt Disney Animation we made the Lion King we will make movies and the people will come. Now you realize there are great movies getting made, live action and animation both, in a way that says we have to continue to not become full of ourselves we cannot have just complete confidence so whatever we will do, will be easy and great. We have to really deeply dive in, we have to do the research. We have to figure out the characters, we have to know how to make the story great! Johannes: You as a producer must feel like in heaven. You are at the right time at the right place. You stayed through the dark times and now you are there, everything pays of. No you have to control these really great creative people to not make this movie for 500 Billion Dollars, you just have a such and such amount of money. So you have to choose what to take and not to take. Is it hard to do? Clark Spencer: … then I go home thinking, we did not solve that problem. It is still in my brain. As a producer I am still thinking we have to solve that problem. But I know the ideas were just not good enough and fundamentally what drives me a s producer is we got to create the best idea. Once we do, everything else will figure its way out. So again it is sort of a longer term strategy rather then a short term strategy because it is very easy to check boxes and say we did that we did that we did that because that won´t lead to the best movie. On the other side of it to your point you have to balance the fact that you can´t just say we will spend nine month trying to figure out that creative idea. There has to be a moment where you say we have to at least to land on something. But I have one huge toolset I always can fell back on which is John Lasseter and the story trust. So if we ever get in a place where I feel we need another set of eys in here, we need somebody else to help us understand what we are mssing we can always go to them. And John comes to Disney to Burbank every week on a Tuesday and a Wednesday so we always have the ability to get another set of eyes in there to help us unlock something. So that as a producer that is my job. My job is to say I feel like we are in a place where we need somebody else. May be it is a visual developing artist. May be it is another story artist. May be it is a different writer coming in for a moment. For a day or two just to brainstorm some ideas. Whatever that is, this is my job as a producer. To say i feel like we hit a point where we need a few other influences in here that will help us to unlock something in a great way And that is one of the things we are lucky about, because we have all these talented people in a building that we can kind of draw upon. But you have to watch at what point you feel like that is the next step only to take. Johannes: So it is essential to have everything under one roof. Johannes: Here in Germany we have the attitude that animation can be done in East Asia while preproduction can be done in Italy, here we will fund the money, we are giving the money. And its all dislocated, its all over the place, spread out. It is a very hard thing to communicate between an italian and a german guy, you can imagine how difficult it is for a german guy to discuss things in english with an eastasian guy living in a different cultural setting and timezone… You have so many countries under your roof, but you have one roof. Clark Spencer: And this is really a gift! You know there a many ways to make a filmto your point and it is much more complicated when you make parts of it in different places around th world or even in different parts of the United States, that would become very complicated but we a re lucky because we do have everything under one roof. Yet we still get a very international feel to it because people come from all over the world. People from Asia, from all parts of Europe, all over South America and even Africa We have people who have come to the studio in a way to build in and bring in those other ideas which is also important so we are not just one type of mindset. We have other creative minds in there that come from all the other parts of the world and they can unlock other things or are familiar with other things we ourselves in the United States might not be familiar with and I give again a lot of credit to John and Ed who really feel like it is the strongest way to make a movie. Because if everyone is under one roof communication is immidiate. And it is clear and the minute it is not clear you immidiately know that it is not working. Right, you know, like somebody got the wrong idea as supposed to I have communicate something in a week or two I see something that now tells me, that idea did not get communicated quitecorrectly you can actually see it in the work in a moment. This working method is really beneficial. Johannes: How much time do you need to stay on the edge of development and new trends. What is the toys can look like what would be an idea for the theme park what is an idea for a game and you start realizing it ios way bigger then just this one story but in the end of the day you still have to figure out and give the time to make sure that all that is of the same quality of the movie. Johannes: Will we still have linear storytelling in the future or will that change? Clark Spencer: That is really a good question and I feel like I am not enough on the cutting edge to give the exact answer but my gut tells me that cinema has existed through all of these evolutions of technologies, so there is something about linear storytelling and great storytelling that still makes the people wanna see movies in a way that people saw 60, 70 years ago. That will not change. That does not mean that more people want to see in other ways and virtual reality could be a new way to go do that. But there is something to me, personally, something about the communal idea of going to a theatre to sit with all these people and the laughter and the emotion, the tension, that people hold in their seats – there is an energy to that, that I feel like will always be the thing that draws people to the cinemas or -knock on wood- draws people to the movies because I like to see movies on the big screen.